Valerian, Valeriana officinalis, makes a sedative tea. The use of the roots is approved by German Commission E as a remedy for insomnia, anxiety and nervousness. A tea made from the fresh root puts one to sleep and allows them to wake refreshed and energised. Also a valuable addition to compost; rich in phosphorus, magnesium, potassium and zinc. It is said that a Valerian plant stimulates earth worm activity in the garden. An infusion of the leaves is used as a spray to promote disease resistance, including dampening off. A companion plant. 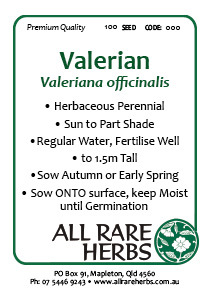 Valerian is native to Europe and north Asia. Prefers moist, rich soils in a protected, semi-shaded position. Clusters of pink to white flowers in summer. Frost resistant but drought tender. A perennial plant, growing to 1.5m x 1.5m. Be the first to review “Valerian, seed” Click here to cancel reply.